Sleek - Diamond Decade Collection! I remember the first time I came across Sleek Make-Up, it was around 5 years ago in a Superdrug store and I could not get enough. I was amazed that I hadn't come across it before and thought it was probably because it was fairly new (although it was 5 years old at this point!). My local Superdrug and Boots are so small, its no surprise they didn't stock the brand - and this was before I turned to Instagram and Youtube for reviews and info about all things beauty! I remember swatching the eyeshadows and being amazed that they were not chalky and they were so pigmented - and the best bit was the price! As a uni student with very little/no disposable income, it felt heavenly to only have to pay £10 for a palette that had 12 different shades in it. My instant favourites were the matte me liquid lipstick in Birthday Suit, which took me a lifetime to get hold off because it was always out of stock, or the contour kits which normally ranged from £7-10. Sleek as a brand was actually my start to beauty blogging in a way, because it allowed me to replicate and try out looks I saw on my favourite bloggers without having to invest a crazy amount of money into high end products - because lets be real, back then there was no way I had £30-40 for a contour palette! Fast forward several years, and not only have I had the pleasure of buying and testing a lot of different brands (including the high end ones) but also the luxury of working with so many of these amazing companies! Sleek, will however, always remain one of my favourites. The quality of the products, especially when you consider the price, in my mind beats a few of the high end brands I have tested! They are always releasing new products and staying on top of their game. And if all of that wasn't enough, when I see the likes of fellow hijabi bloggers like Habiba Da Silva being invited on the panel for Sleek events, or Sabina Hannans videos being featured on their website, it just makes me love them even more - not only do they have amazing products but they clearly value ALL of their customers! Now onto the actual review, sorry about the slight degression but I haven't tapped out a post in forever and I actually forgot how much I enjoyed this writing malarky :) So this year Sleek celebrated their 10 year anniversary, and as part of the celebration they released their Diamond Decade collection. They were kind enough to send me the limited edition I Divine Diamond Decade eyeshadow palette and the Lip VIP Lipstick in Dream Decade. I've included images and swatches of both below, but am yet to try create any looks with them - but I know I will be pulling them out more than once over the next few months as its party season and the colours are just perfect for that glam party look. The eyeshadow palette, which retails at £8.99, features 12 different mineral based highly pigmented colours. 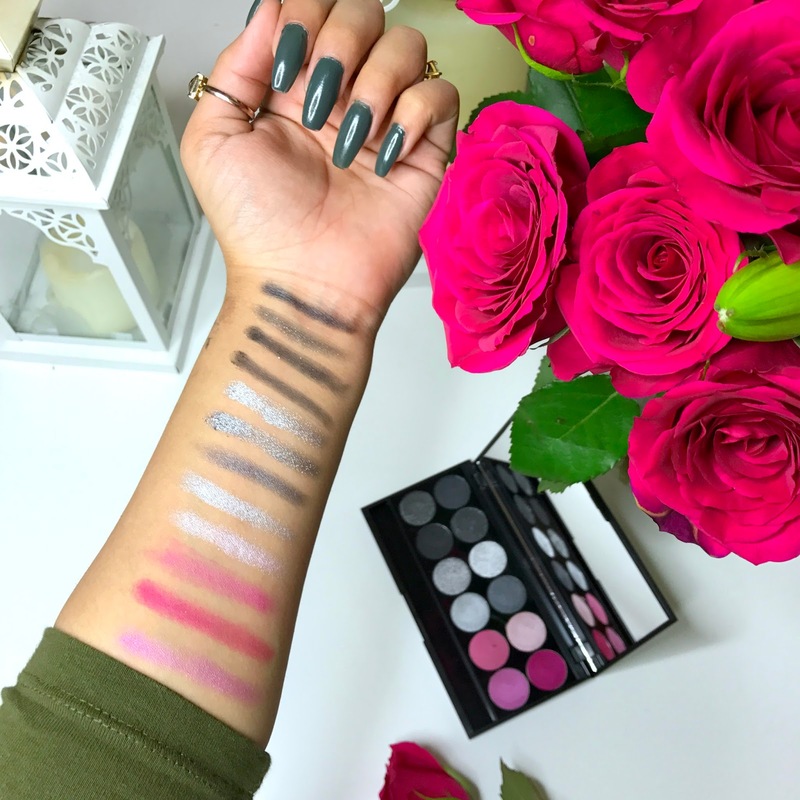 Working out at less than 74p per shadow, the colours range from blue/purple toned blacks and silvers with 4 pretty pinks to add that party pop. The Lip VIP Lipstick is probably one of the hottest shades of pink I've seen in a while - personally I would probably rock this with a minimal eye look because I think its so bold on its own. But if you check out Sabina Hannan's video here she shows you a super easy way to rock a pink lid with the pink lips - and isn't she just s gorgeous!